Accountancy can be defined as the process of recording business transactions in the books of accounts of the business enterprise. Accountancy includes process and procedures of recording and presenting financial transaction in financial statements. Accounting professions are those groups of people that are engaged in the accounting of the information or business transactions (Collings, 2012). These accounting standards and international financial reporting frameworks are issued so that support to accountants in terms of recording of business transaction of the business organization can be provided. 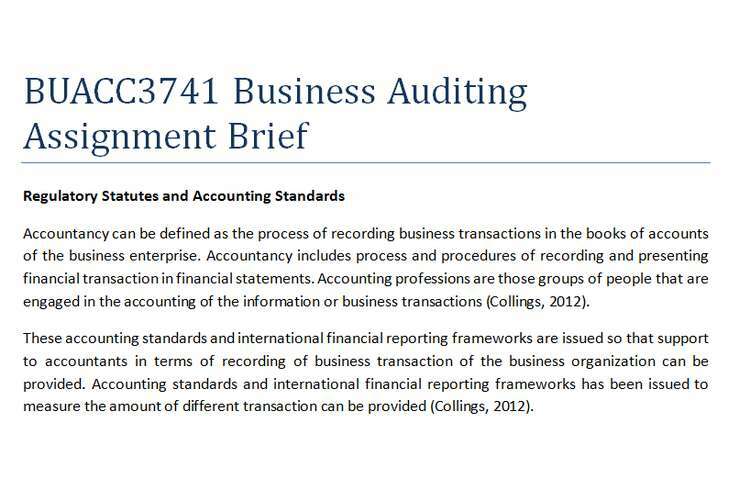 Accounting standards and international financial reporting frameworks has been issued to measure the amount of different transaction can be provided (Collings, 2012). Financial statement are those set of papers which reflects decision making information for the investors. Therefore financial statements are important part of communication process therefore it shall be prepared with more reliability and accuracy. Apart from financial statements of the business organization there is various other information also present that shall be disclosed by the business organization. While audit the accounts and financial statements of the business organization auditor shall ensure material facts are disclosed like is material contract has been undertaken, change in directors, change in objective of the organization, huge impairment of asset, etc. Auditors are responsible for analyzing the effectiveness of the financial statements of the business organization. So that investors can rely on the financial statements. Directors are the ultimate decision maker in the organization on the basis of some relevant information. Directors play vital role in the business management and decision making process of the organization. In order to become director there are some criteria that shall be fulfilled by them and these criteria makes them more reliable. Shareholders are typically owner of the business organization because they had provided funds to the business organization. Therefore it is duty of business organization or its executives to protect the interest of the shareholders. Directors of the business organization are responsible for protecting the right of the shareholders of the company.